Exercising regularly is one of the best ways to attain long-term health. It can help you stay fit, strengthen your bones and muscles, improve your mood, increase your life expectancy, and even reduce your risk of heart disease, type 2 diabetes and some cancers. But it can be very difficult to maintain a consistent workout schedule. There’s no real secret to committing to a regular exercise regimen, but there are definitely things that make it easier. If you can cut out the need to drive to a gym, for example, you topple one of the major barriers that often keeps people from sticking to their routine. That’s why Arden offers an oversized, state-of-the-art Fitness Center as one of the many resort-style amenities residents can enjoy within an easy walk from their homes. Whether you’re trying to get into exercising for the first time in your life, a regular athlete who simply needs to keep up with your usual regimen or a former exercise buff who’s fallen out of practice, Arden’s Fitness Center has everything you need to achieve your fitness goals. Cardio is important for your heart health and metabolism, but not many people look forward to a half hour on the treadmill. Arden’s Fitness Center provides tons of options to help break through the occasional tedium of cardio exercise. In addition to the essentials like treadmills and ellipticals, residents will have access to exciting, innovative equipment like the Expresso HD Upright Bike with shifting gears, turning handlebars, automatically adjusted resistance and a 23” HD screen that displays over 40 virtual tours to give you the true experience of cycling outdoors, without the weather and insects to worry about! And if you’re looking for an instructor-led fitness experience, catch a class with one of the professional trainers or workout when it’s convenient for you with our Wellbeats virtual fitness classes on demand. For both men and women, weight training is a great complement to cardio exercise as a way to build muscle and improve bone density. 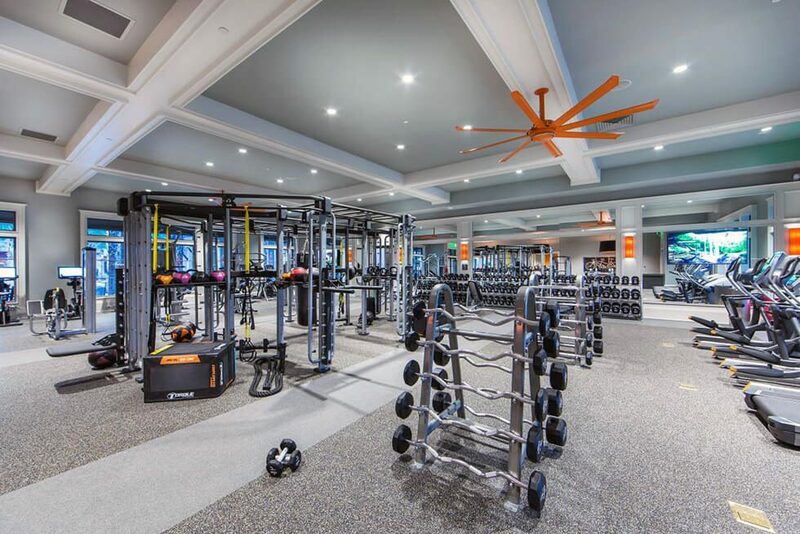 The spacious 3,000-square-foot Fitness Center allows plenty of room for the kind of top-of-the-line strength training equipment you’d never find in a home gym. One such set of impressive equipment is the Torque Fitness Cage. This is a one stop for beginner, intermediate and advanced athletes alike. Here you can find medicine balls, kettle bells, an adjustable step up platform, soft-surface box jumps, battle ropes and even TRX bands, just to name a few. And for those new to exercising who might feel a little out of their depth when walking into such a comprehensive Fitness Center, have no fear. Arden’s Fitness Center has fitness experts on staff, available to residents looking for some guidance or professional training sessions. It’s easy to make excuses or to fall out of your workout routine. But it makes it a little bit easier to stay on track with your fitness goals when you have a state-of-the-art Fitness Center with professional trainers and dynamic equipment, all within walking distance of your home. To learn more about Arden and its amazing amenities, join our Founders Club and be the first to receive updates about our community.